The Blitz (Lightning) was the only turbojet-powered bomber to achieve operational status in World War II and is a milestone in military aviation’s development. Its evolution dates from a 1940 requirement issued by the German Air Ministry (Luftfahrtministerium) for a fast reconnaissance aeroplane. 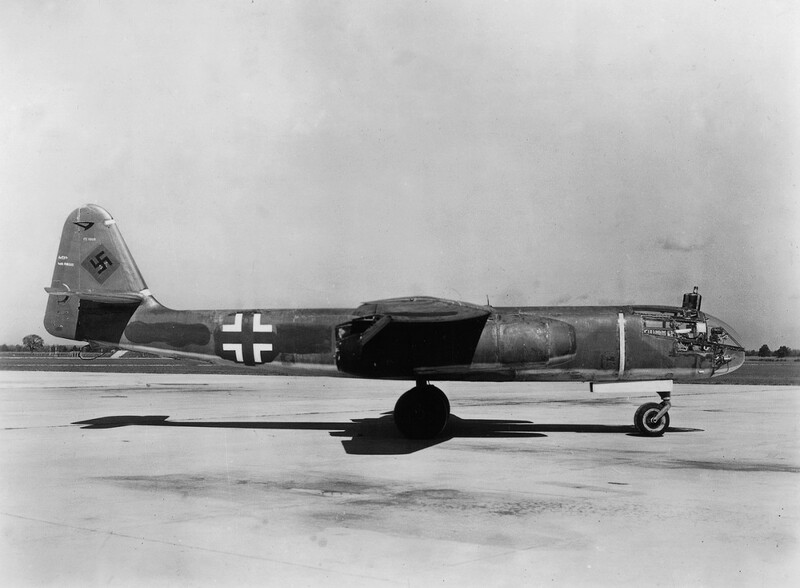 An intensive programme of design and development resulted in no fewer than 18 prototypes, featuring a powerplant of two Junkers 004 or four BMW 003 turbojets, provision for rocket-assisted take-off units, a cabin with or without pressurization and an ejection seat, and a clumsy combination of a drop-away trolley for take-off and extendible skids for landing. A ­­­few of these prototypes were used from July 1944 by the reconnaissance units (Aufklärungsgruppe). The production Ar 234B was intended for the reconnaissance bomber role with hardpoints under the fuselage and two engine nacelles for a 500kg (1100lb) bombload and utilized retractable tricycle landing gear in place of the trolley, an arrangement pioneered in the Ar 234 V9 prototype. Some 210 Ar 234B-1 reconnaissance aircraft with drop tanks in place of bombs and Ar 234B-2 reconnaissance bombers were built. The type entered service in September 1944, and was complemented by just 14 examples of the Ar 234C with the revised powerplant of four BMW 109-003A-1 turbojets.